The crystal clear 7” LCD Monitor is a perfect addition to any driver that needs assistance backing up. See the whole world behind you in rich colors. It is also an LCD monitor so it is very light as well as thin. In addition, it has two video inputs so you can connect a camera and a game system or DVD player. This monitor is compatible with all our cameras and any car; it connects to any power source or a cigarette lighter. 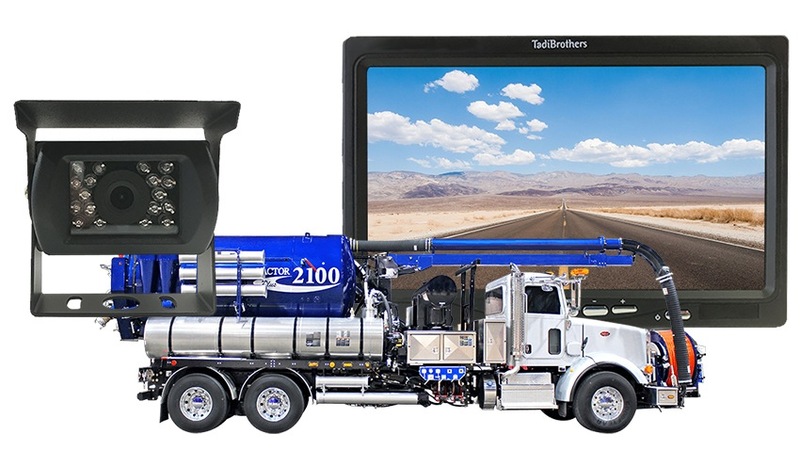 The Sewer Flusher Truck camera Has a 120° Degree viewable angle, its waterproof and has auto night vision. The camera is one of the most durable we have, with incredible adjustability and night vision clarity. The RV Box camera has a metal sun shield visor to protect you from glare and pebbles. This Sewer Flusher Truck backup camera system includes a 50 Foot cable, we have premium extension cables located on the top left of the page if you need one. This reverse system, like most of our vehicular products that have an LCD screen, can be used for video gaming, Considering that a perk or bonus for purchasing our back up system (others block that feature).